Hmm.. I doubt it Adrian, "launch" is defined as the point at which the new hull enters the water. This is already in the water. However, stranger things have happened. Could they have moved it from the Yard # to make way for the next vessel and offically launched it later when the had a buyer??????? OK, thanks Adrian. I suppose that the launch date could be wrong, but it concurs with DNVGL class records. 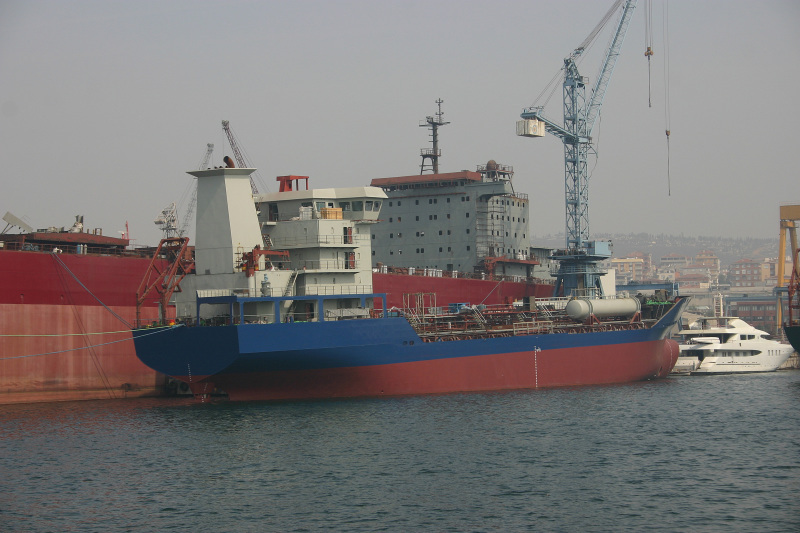 This is a Deltamarin-designed 7,000 dwt chem, several built by various Turkish yards but not all have the swept-back funnel design and not all have the forward deck tank. I struggled to find one where the lauch date/delivery date would fit. The AMANDA IMO 9305362 which Ilhan suggests, was launched on 15/10/2004, which is after this photo was apparently taken. the superstructure of this vessel has one deck more than YM VENUS. Must be another vessel. Do you know the names of the 4 ships? Could it have been the Plevne???? It looks like one of this type built 2005 onwards, 4 were built but the given date does not match. This one was launched in June and completed in November 2005 by Tuzla Gemi (26). This photo has been shown 988 times since it was added to the site.